Plenary lecture - 35min Invited speaker presentation - 25 min Presentation - 20 min. Authors are invited to submit one page abstract/graphical abstract in English (font 12 pt Times New Roman, 1.5 spaced), including figures, tables and references. Abstracts should be submitted by e-mail to: nanogroup.unn@gmail.com, fabian.ezema@unn.edu.ng, fiezema@yahoo.com, admin@nanotechunn.com. The closing date/ deadline for submission of abstracts is May 30th, 2016. Announcement of the Second Nanotechnology Conference/Workshop: African International Conference/Workshop on Applications of Nanotechnology to Energy, Environment, and Health. July 4-7, 2016. Proceedings from the Second Nanotechnology Conference/Workshop: African International Conference /Workshop on Applications of Nanotechnology to Energy, Environment, and Health. July 4-7, 2016. Proceedings from the First Nanotechnology Conference/Workshop: African International Conference /Workshop, March 23-29, 2014. Selected papers presented during workshop will be printed in the special issue of the conference proceedings. The manuscripts will be peer reviewed. Deadline for conference paper submission is June 30th, 2016. 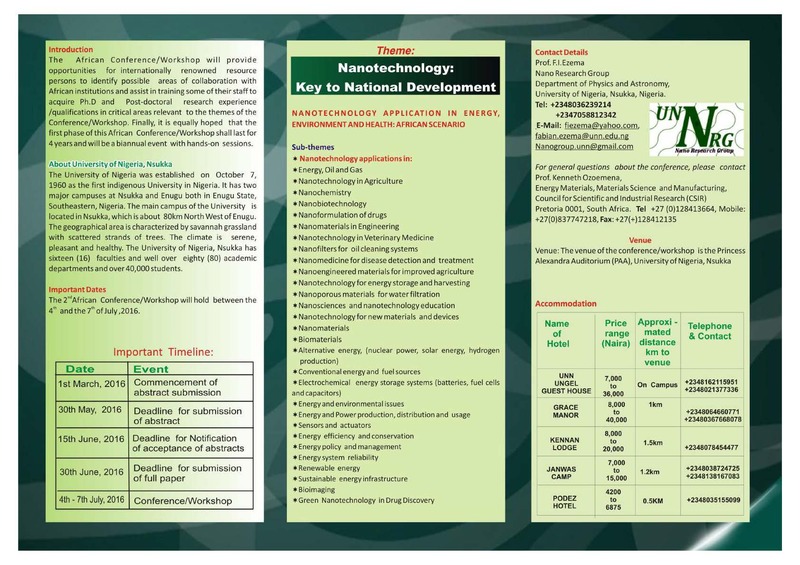 This will be the second Nanotech conference at UNN.